I was half-way through preparing this bird of the week this afternoon when my 2008 iMac died, or at least got terribly ill, so I’ve delivered it to the Mac Doctors and am now working on my laptop. Thank goodness for automatic backups, as I lost only the email itself and the map below that I was in the middle of preparing. I want to get the email out today so that i can delivery 4 birds of the week this month – my level of enthusiasm for doing the bird of the week has risen considerably since I started preparing the first volume of the Diary of a Bird Photographer. Anyway, back to the Loyalty Islands off the west coast of the main island of New Caledonia. 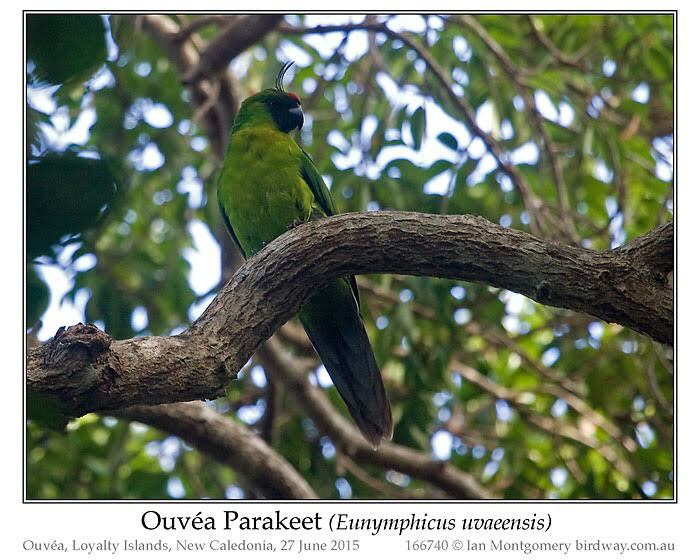 After spending the morning in Lifou, we flew to the neighbouring island, Ouvéa, home to the endemic Ouvéa Parakeet. Ouvéa is a long thin island, thinnest in the middle in a way that reminded me of both Bribie Island in Tasmania and Lord Howe Island. Like Lord Howe, it has a coral lagoon on one side and an ocean beach on the other but the resemblance largely ends there, as Ouvéa is a coral atoll and very flat, while Lord Howe is volcanic in origin and spectacularly mountainous. 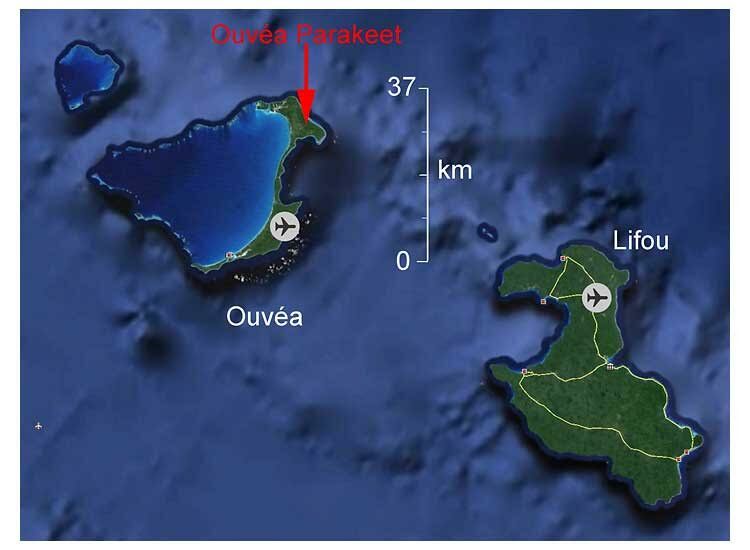 The parakeet occurs mainly on the northern end of the island so its geographical range is tiny – see the scale on the map above, courtesy of Google Earth. The airport is on the southern end and we decided not to emulate some energetic birders who wrote a trip report and travelled from the airport to the north end of the island by bicycle. Instead, we had booked a rental car at the airport and booked accommodation in a tribal village called Gossanah in parakeet territory near where our bird guide Benoit lived. I’ll say a bit more about both our guide and accommodation later, but first the parakeet. It was dark by the time we reached Gossanah, so parakeet hunting had to wait until the morning. I was woken up by early-riser Joy with the exciting news that there were parakeets in the grounds of where we were staying. I stumbled out bleary-eyed (remember we had got up at 4:30am the morning before to get our flight to Lihou) camera in hand and sure enough there they were, or there it was, first photo. Later we joined Benoit and he took us around his garden and though an area of adjacent rainforest. There we found some more parakeets, including the one in the second photo. They aren’t as brightly coloured as the Horned Parakeet of the main island, Grand Terre, and the crest is different, containing more than two feathers and lacking red tips. 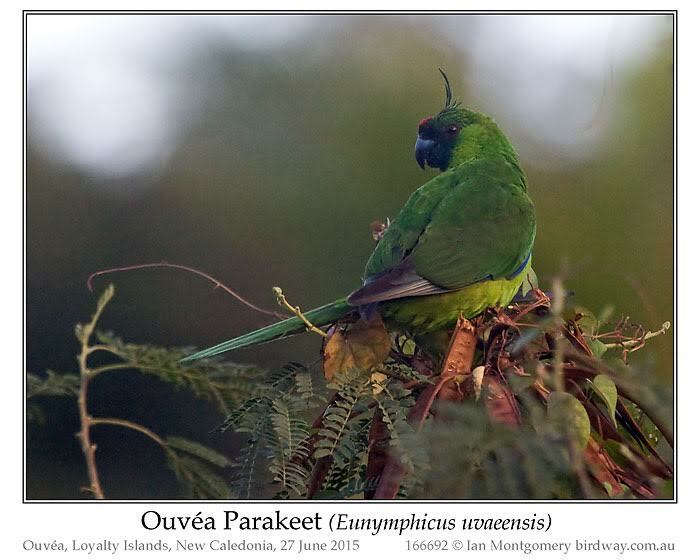 The Ouvéa Parakeet used to be treated as a race of the Horned, but has now been given full species status. 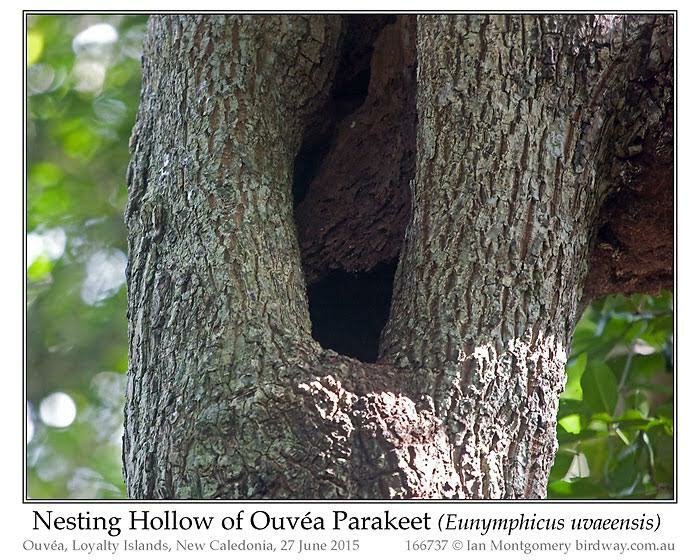 Benoit showed us an active nesting hollow, third photo. We saw a parakeet flying into it and waited for it to reappear, but it had either settled down for the morning or had more patience than we had. 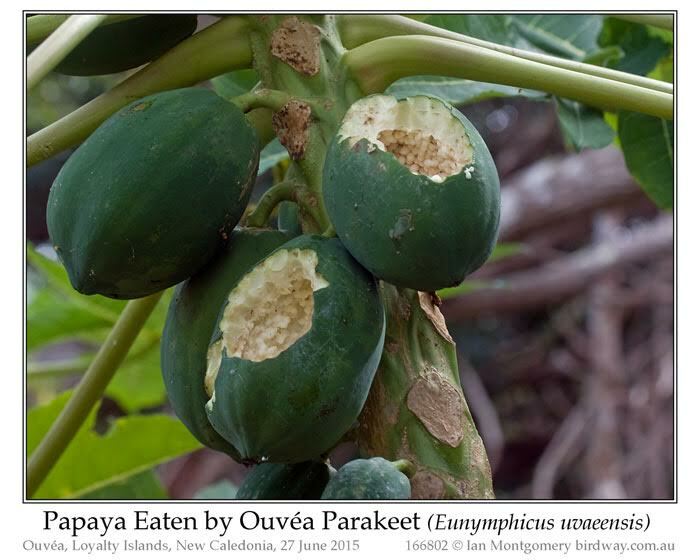 The parakeets are very partial to the seeds of Papaya. They don’t wait for the fruit to ripen before they chew their way into the centre to get at the seeds. The parakeets are protected and the population has increased in recent years. We got the impression that the islanders are rather ambivalent about the birds. They are proud to have such an unusual endemic bird – its iconic status is actively promoted by the authorities – but are concerned about its effect on their largely subsistent way of life. We stayed at a tribal home stay called Beauvoisin – ‘good neighbour’ run by Marc and his wife (see http://www.iles-loyaute.com/en/Prestataire/Fiche/1374/beauvoisin). 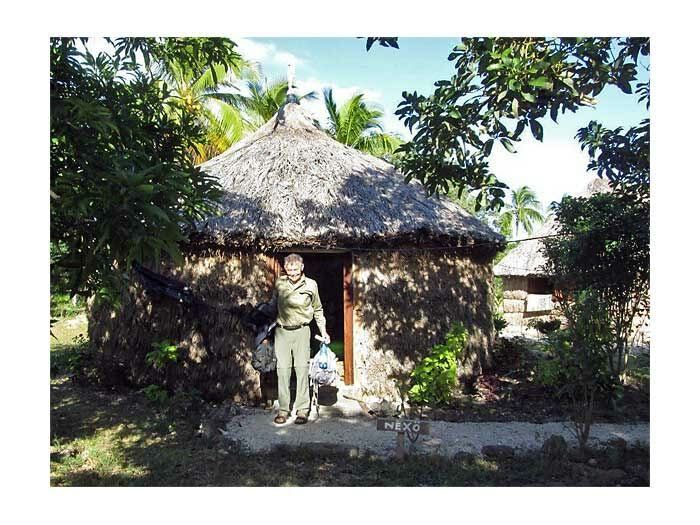 They provided dinner in the evening, accommodation in a circular hut and breakfast – Joy took the photo above of me emerging from the hut in the morning. We enjoyed it very much and Marc and his family were delightful and looked after us very well. They spoke some English and have a Facebook page. Benoit Tangopi our guide was great too and we saw a variety of other interesting birds on the walk through the rainforest. We contacted him by phone +687 800549, but you might need to brush up your French as he doesn’t speak much English. Thanks, Ian, for taking us along on another birdwatching adventure. I don’t speak French, so we are glad you did the talking and photographing. Another neat creation you have found for us to enjoy. 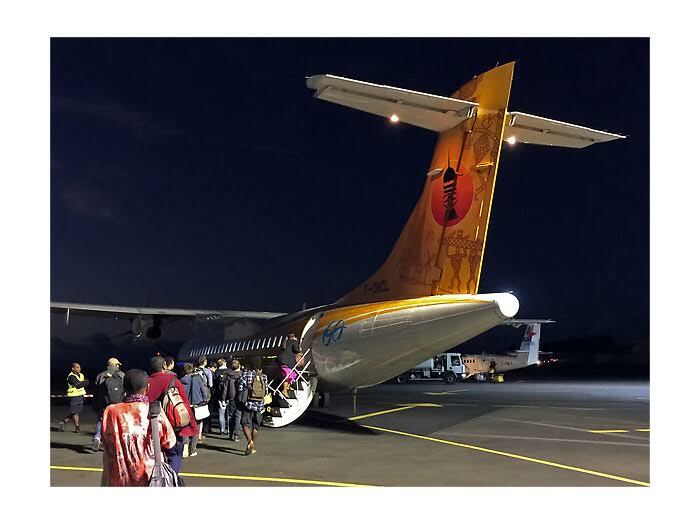 I’m a night-owl, as you may know already, so here is a photo of a noteworthy event: boarding a flight to the Loyalty Islands in complete darkness at 6:00am at Magenta, the domestic airport in Noumea. The goal was to check out several endemic species of birds that occur on two of the Loyalty Islands, Lifou and Ouvéa. The Lifou endemics were supposed to be easy to find near the airport, so we spent a morning there looking for them on foot before flying on to Ouvéa where we had booked a rental car and accommodation for the night (more about Ouvéa next time). The Loyalty Islands, part of the French Territory of New Caledonia, are supposedly named after an obscure whaling ship called Loyalty or Loyalist built in Nova Scotia in 1788 that is thought to have come across them in 1790. The first recorded Western contact was three years later when another whaler, the Britannia, found them on a voyage from Norfolk Island to Batavia. Melanesians settled the islands about 3000 years ago and the French annexed them in the mid-nineteenth century. 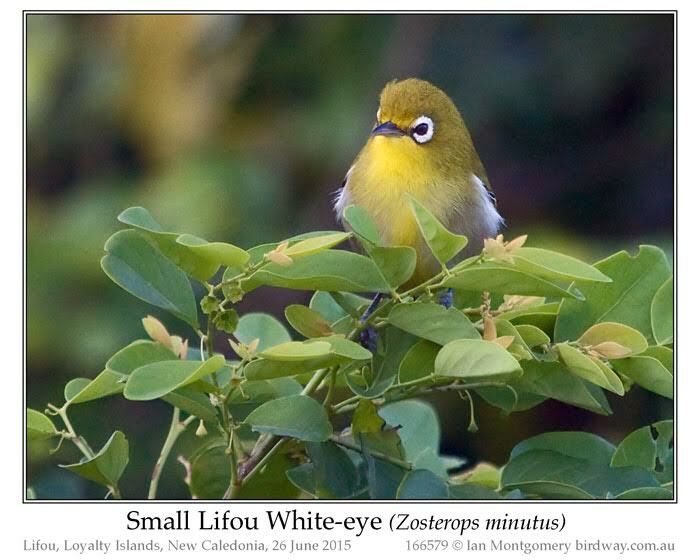 Lifou has two endemic White-eyes, cousins of the Silvereye which also occurs there. The endemic ones are called, accurately but unimaginatively, the Small and Large Lifou White-eyes. The small one we found without difficulty and it is indeed small with a length of 10-11cm/4-4-4.3in and weighting 7.5-9g/0.26-0.31g. Its diagnostic feature is the white flanks, most obvious in the third of its photos. We search quite hard but unsuccessfully for the Large Lifou White-eye. It’s very large for a White-eye (15cm/6in) making it even larger than the Giant White-eye (Megazosterops palauensis) of Palau. Interestingly both of these large species lack the white eye-rings that gives them, and the Silvereye, their common names. 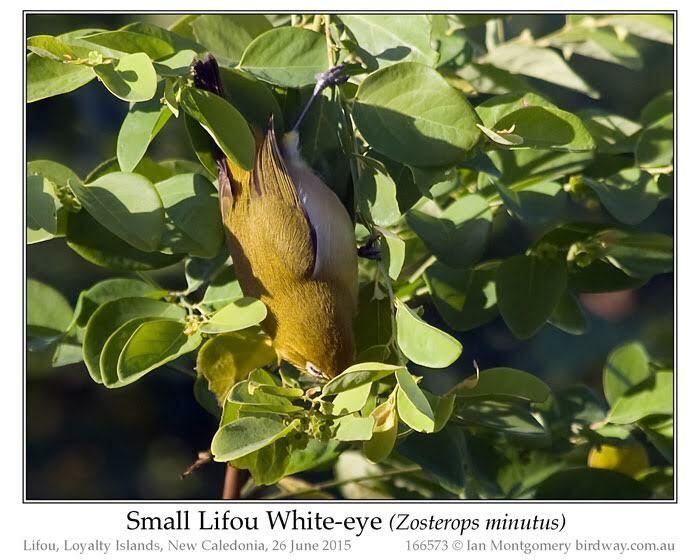 The Small Lifou White-eye feeds mainly on insects while the large one shows a preference for fruit. This specialisation in diet and divergence in size is to expected in similar species occupying the same habitat, but these two seem to have taken it to extremes. 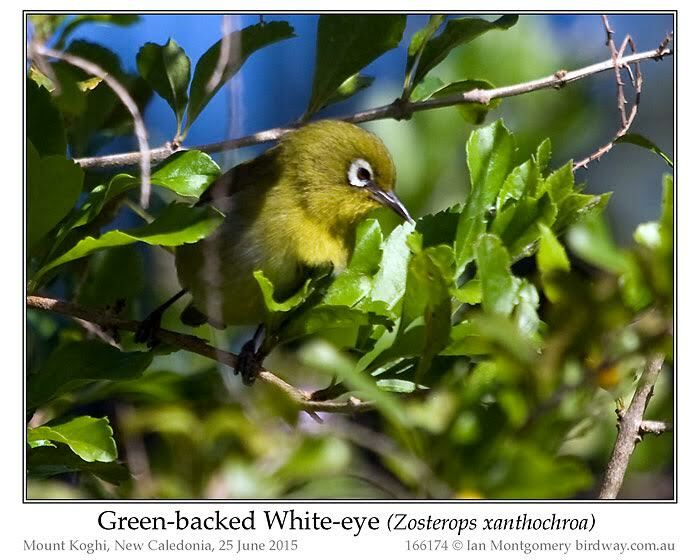 The Small Lifou White-eye is close related to the slightly larger Green-backed White-eye (fourth White-eye photo). It occurs on the main island of Grande Terre, the Isle of Pines (south of Grande Terre) and on Maré southwest of Lifou. Meanwhile there are three local races of the Silvereye, one on Grande Terre and the Isle of Pines, another on Maré and Ouvéa and the third on Lifou. This complex pattern of colonisation and speciation is typical of members of the family, the Zosteropidae. This is a very successful Old World family with almost 100 species in Africa, Asia and Australasia. They seem to be experts at colonizing out of the way islands, occurring on many islands in the Indian and eastern Pacific Oceans, where they settle down and develop new races and species. 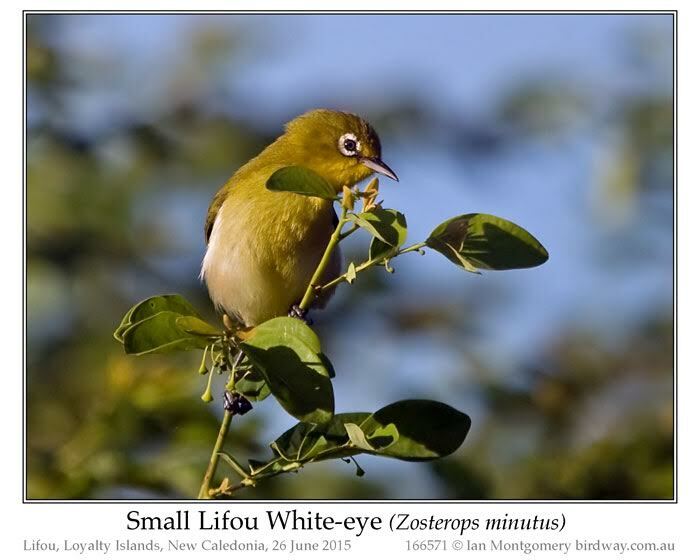 White-eyes are very sociable, so it is easy to imagine flocks being blown around by storms or cyclones and making landfall in sufficient numbers to colonise new places. 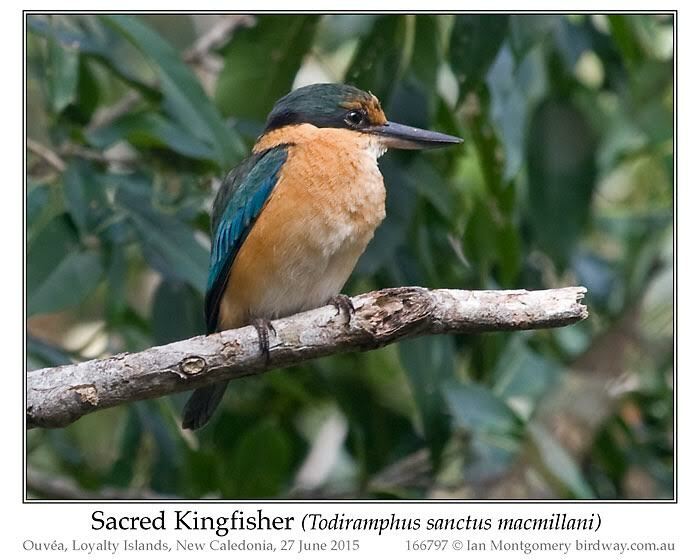 For the random bird of the week, here’s another species that is good at island hopping, the Sacred Kingfisher. Well known throughout all but the driest parts of mainland Australia it also occurs on some southwest Pacific islands including those of New Zealand and New Caledonia. It has one race on Grande Terre and the Isle of Pines and, you guessed it, another one on the Loyalty Islands, below. This race has very buff underparts and a shorter, slightly flattened bill. Finishing on a quite unrelated matter, you may have come across recent news, if you live in Australia, about the ultimate in elusive birds , the Night Parrot and the work that Steve Murphy has been doing since its rediscovery by John Young. Bush Heritage Australia is raising money to create a sanctuary to protect this population in southwest Queensland. I’ve already made my (modest) donation and I’d ask you to do so too using this link to make a very practical contribution (yours doesn’t need to be modest) to conserving a very special bird. I love those EYES! Every since learning about the White-eyes, they have become one of my favorite species. Thanks, Ian for sharing these adorable birds with us. Kingfishers are also a favorite. My problem is that when I use my “eyes” to view the Lord’s fantastic birds, how can I not have a problem figuring out which ones are my “most” favorites. I love all of the Lord’s Avian Wonders. I trust you do also.